Meal times are special. This is where food is shared, stories are told, and relationships are fostered. 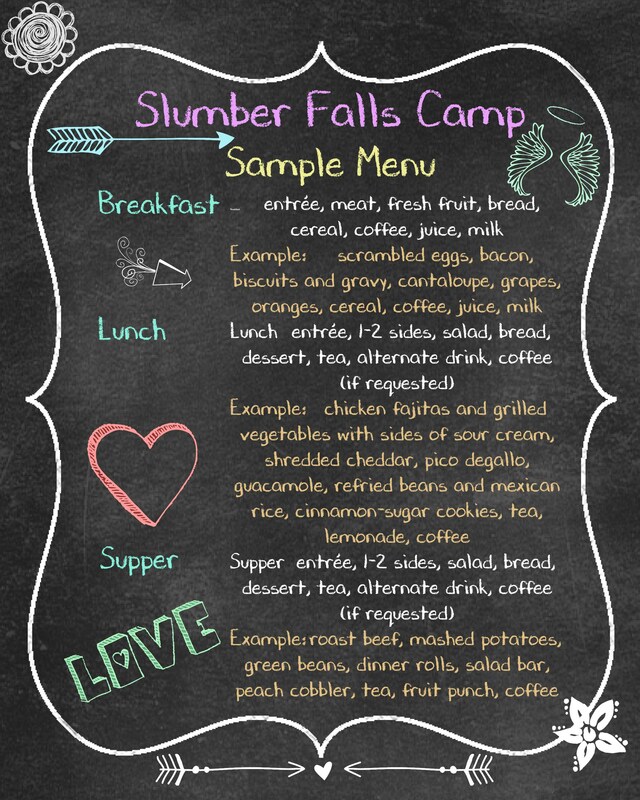 Slumber Falls is known for great food! We have a classically trained chef that makes the everyday meal options, extraordinary! Food service requires a minimum of 20 adults. Smaller groups can pay for the 20 to receive food service. 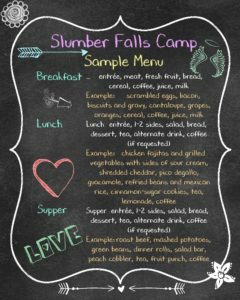 All meals are prepared and served in Woelke Lodge. Groups renting Kelsey and Bizer have the option of food service if the group renting Woelke is also taking food service. We reserve the right to adjust menu selections based on our inventory and the needs of the groups for which we are providing food service. We can accommodate vegetarians and gluten free; however, these and other special dietary requests must be made at least 10 days in advance in order to prepare the menu and food order, and are subject to approval of the Food Service Manager. This is a sample menus of what could be offered. To learn about the larger selection of food, please contact the Food Service Manager. Please remember to share any dietary needs in the email.